The Big Takeaway: Bobby Roode and Kevin Owens qualified for the Money in the Bank match. Owens received another chance to qualify after Roman Reigns speared Jinder Mahal through a wall after the two had a confrontation earlier, which left Mahal with injured ribs. Alexa Bliss qualified for the women's Money in the Bank match. 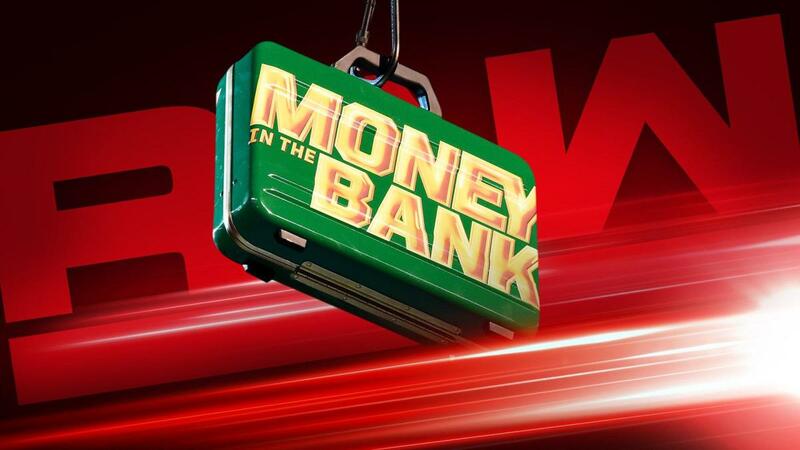 They officially announced Nix Jax vs. Ronda Rousey for the Raw Women's Championship at Money in the Bank. Highlight of the night was Seth Rollins defeating Owens to retain the Intercontinental Championship. Right at the top, they made the announcement that Nia Jax would defeated the Raw Women's Championship against Ronda Rousey at Money in the Bank. Reigns started the show. Got booed out of the place. Reigns said he got robbed last week, and this time it wasn't by WWE management, it was by Mahal. Reigns challenged Mahal to come out and face him if Mahal wanted to be more relevant than he's ever been before. Instead, Kurt Angle came out and said Mahal won't be coming out. Reigns wanted to know when did Angle start speaking for Mahal. Angle said he doesn't speak for Mahal, he speaks for WWE management. Angle said when he denied Mahal the opportunity to compete for the Money in the Bank ladder match last week, he was thinking emotionally. He said, with a tone of regret, he should be thinking about what's best for business. Tonight, Mahal will compete against Bobby Lashley and Elias in a Triple Threat match for a spot in the Money in the Bank match. Reigns asked to be added to the match and make it a Four-Way. Angle said that's not happening and WWE management has made it clear that Reigns won't be getting anymore Money in the Bank qualifying matches. Angle said he understood if Reigns was pissed off. Reigns said he understood because Angle had to do what he had to do as management. Now, Reigns said he was going to do what he had to do. Reigns walked to the back looking for Mahal. Reigns found Mahal, who threw Sunil Singh into Reigns, then jumped Reigns. They brawled backstage with Mahal throwing a trash can to Reigns' ribs. Reigns reversed course and sent Mahal into a wall, as well as a table filled with catering items like bananas, then rolled a moving case into Mahal. They fought to the ramp, where Reigns scored a Superman punch to boos. Angle, Adam Pierce and Jamie Noble, along with several referees, stepped in between Reigns to break it up. There was a good heat spot early where Rollins attempted a tope, but Owens caught Rollins across his shoulders and sent Rollins head first into the post. Owens backdropped Rollins over the top rope. Owens teaed power bombing Rollins on the apron, but Rollins wound up landing on his feet on the apron. Rollins fallowed with a Falcon Arrow on the apron. Owens missed a charge and fell out of the ring, leading to Rollins hitting two consecutive topes and a springboard clothesline. Rollins hit a blockbuster for a two count. Rollins went for the Rainmaker Knee (now called the Revolution knee), but Owens turned the tables with a DDT. Owens went for the Pop Up Power Bomb, but Rollins leap frogged it, Rollins missed the stomp but connected on an enzuigiri, but Owens hit a clothesline for a near fall. Owens went for a somersault senton, but Rollins got his knees up. Rollins missed the stomp, but hit a superkick and scored with the Revolution knee for a near fall. Rollins went to the top rope for a frog splash, but Owens caught him with knees to the gut and rolled Rollins into a cradle for two. Owens went to the top rope, but Rollins went up and teased a superplex, yet Owens turned it into a twisting Super Fisherman's buster. Rollins rolled out of the ring. Owens went out after him, and as Owens got back int the ring, Rollins caught him with the Stomp for the pin. An excellent match. They showed footage from Radio City Music Hall from NBC Up Front, which previews next fall's shows with various NBC personalities. Of course, Stephanie McMahon and HHH were shown before they got to an interview with Rousey. Charlotte Flair joined Rousey on the promo. Then Jax walked in and asked if Rousey could be Raw Women's Champion. Jax challenged Rousey to a match at Money in the Bank. At first, Rousey turned it down because she had had only one match. Jax repeated the challenge and Rousey accepted. Then Charlotte said "Whooo." The three laughed and walked away together like they were friends. It wasn't confrontational in the least. Bo Dallas and Curtis Axel walked up to Angle and put over Jax vs. Rousey. Axel asked for a tag team championship match. Axel said from now on, they're going to be called "The A Team." Angle said that name was taken. Dallas proposed being called "The B team" with the B standing for "best." Angle reminded Dallas and Axel that they've never won a tag team match and Matt Hardy and Bray Wyatt just beat them last week. Dallas said Axel and Dallas may not have won a match, but the B Team was undefeated and how could Angle turn down a title shot for an undefeated team?. Angle said he would put them in a match later tonight if they promised to leave him alone. They hi-fived and walked off. No Way Jose spent the first half of the match on the floor as Baron Corbin worked over Bobby Roode. Roode hit a spinebuster on Jose for a two count. Not much heat. Roode hit a flying clothesline on Jose and teased the Glorious DDT, but Corbin came up from behind. Roode knocked Corbin off the apron, Jose schoolboyed Roode for a two count. Roode was knocked to the floor, and Corbin hit Roode with a flying clothesline off the apron. Corbin hit a chokeslam backbreaker for a two count. Corbin tried to chokeslam Roode, but Roode hit a sunset flip for a two count. Corbin followed with the Deep Six on Rood, but Jose broke it up. Crowd started singing soccer fight songs as Corbin hit clotheslines to opposite corners, then missed and went to the post. Roode hit Jose with the Glorious DDT for the pin. Owens approached Angle backstage and demanded a rematch with Rollins. Angle told Owens he lost. Owens persisted and threatened to call Stephanie McMahon. Angle said he's getting sick and tired of Owens threatening him. Owens said it wasn't a threat, it's about to become reality. Angle walked into the trainer's room, where Mahal was being treated for bruised ribs. Mahal couldn't believe that Angle was making him compete in the Triple Threat match tonight for the final Raw spot for Money in the Bank. Angle said the match was going to go on because it was best for business. Axel and Dallas came out with white t-shirts with a "B" drawn in magic marker.The fans started chanting "Let's go B team." Frandango went for the Last Dance on Axel but missed. Axel and Dallas hit a combination neckbreaker and Dallas pinned Fandango. Dallas and Axel didn't know how to react after winning, then went crazy after their first win. Charly Caruso did an in-ring interview. Dallas said anything was possible for the B team. Axel tried and successfully started a "B team" chant. Sasha Banks did a spot similar to Evil where she caught a kick by Sarah Logan and swung her to Ruby Riott. then hit Logan in the head, leading to Riott a blow to the midsection. Banks, wearing a Wonder Woman outfit, got the heat. Banks threw Riott into Logan, then rolled Liv Morgan into a schoolgirl cradle. Morgan kicked out but Banks tagged Natalya, who hit a spinning clothesline. Natalya teased the sharpshooter, but Riott broke it up. Morgan hit an enzuigiri, but Ember Moon made the save. Moon backdropped Logan over the top rope. Banks hit the Meteora on Logan, leading to Moon connecting on a tope. Natalya made Morgan tap out with the sharpshooter. Drew McIntyre and Dolph Ziggler did a promo. Ziggler said Braun Strowman and Finn Balor have jumped to the head of the line by smoke and mirrors. Drew McIntyre said they aren't there to take anyone's food off their table, they're there to flip the table over. Matt Hardy pinned Scott Dawson after a Double Sister Abigail. Hardy gave Dash Wilder a rough looking Side Effect before making the tag to Bray Wyatt. The B Team was shown watching backstage taking notes with a "B" written in magic marker at the bottom of their clipboards. We're actually watching Bo Dallas and Curtis Axel get a bigger push than the Revival. As Bayley walked to the ring for her Triple Threat match, Banks wished her luck. Bayley thanked her. Sami Zayn was in the ring. The fans were singing along with his music. Zayn said Prince Harry looks a lot like him. Zayn said he hears that Harry is a fan of his, unlike Lashley. Zayn said Lashley left Raw for ten years and returned on the same night he returned to Raw. Zayn said Lashley made his return at his expense. They showed Zayn getting suplexed by Lashley three weeks ago and chastised the fans for cheering for Lashley over that. Zayn said no one stopped to think what effect that had on him. He contracted Vertigo, the first contracted case of Vertigo in WWE history. Zayn pulled out a doctor's note saying "Vertigo is a debilitating condition that affects one's motor skills." Zayn blamed that for not being in the Greatest Royal Rumble and why he lost the Money in the Bank match last week. Zayn tried to put over Lashley as someone everyone loves and replayed his quirky interview with Renee Young from last week. Zayn said Lashley targeted him because Lashley wants to be him. Lashley was wearing the same type of hat that he wears. Zayn said his instincts told him Lashley had something to hide. So he reached out to Lashley's sister through Facebook and they had quite a story to tell. From what the sisters told him, Lashley isn't the person that he portrays himself to be. Zayn said he invited Lashley's sisters to appear next week on Raw to expose the real Bobby Lashley. Since Alexa Bliss and Mickey James were heels, they ganged up on Bayley. Then James tried to schoolboy cradle Bliss, which led to them shoving each other. Crowd was singing to Bayley like they always do in Europe. Bayley hit a crossbody on both James and Bliss. Bayley hit a back suplex on Bliss, then hit a double stunner on Bliss and James. James came out of the corner with flying head scissors on Bayley. Bliss followed with the Code Red on Bayley, but James kicked Bliss in the face. Bliss hit James by accident. As James started arguing with Bliss, Bayley attacked Bliss from behind. Bayley sat down on a sunset flip attempt by Bliss for two. Then Bayley hit the Bayley-to-belly on Bliss, but James pulled Bayley out of the ring. James tried to cover Bliss, but Bayley pulled her out. Bayley and James started brawling on the floor. Bayley decked James, rolled in the ring, where Bliss floored her with a right and Bliss got the pin with a DDT. The trainer finished taping Mahal's ribs. Singh followed him out of the trainer's room and he limped to the ring. Then Reigns showed up and speared Mahal through a wall made of plywood. Even with that spot, Reigns got light boos. As medics attended to Mahal, Singh pleaded with Angle to cancel the match. Angle said the match would go on and he would find a replacement for Mahal. McIntyre got a good pop. He's deceptively huge, to the point I can't believe this company missed the boat on him the first time around. McIntyre kept cutting off Balor from making the hot tag to Braun Strowman. Strowman leveled Ziggler with a sledgehammer across the chest, but Strowman missed a charge and ran into the post again. That's becoming his "Ric Flair off the top rope" spot. Balor tagged Strowman, who gave Ziggler the Final Cut. McIntyre made the save. Balor caught the Sling Blade, the Woo Dropkick and went for the Coup de Grace, but McIntyre grabbd his leg. Strowman ran around and shoulder blocked McIntyre to the floor. The Greatest Royal Rumble trophy was outside the ring and went flying after McIntyre crashed to the floor. Meanwhile, Ziggler crotched Balor on the top rope and pinned him. Owens turned out to be the replacement for Mahal. Michael Cole cited Stephanie McMahon and HHH favoring Owens as the reason he got a second chance to win a spot in Money in the Bank. No reaction at all for Lashley, which was funny after Zayn put him over as a fan favorite earlier. After Lashley clotheslined Elias over the top rope, the crowd booed him. Lashley sent Owens into the barricade, then threw Elias into the barricade, as well. After Owens and Elias double-teamed Lashley, they turned on each other, which everyone saw earlier this hour. Elias slammed Owens, who looked like he hurt his left knee. Crowd started chanting "Bobby's sisters." Lashley hit a spinebuster on Owens, but Elias caught Lashley with a running knee. With both men knocked out of the ring, Elias wanted to start a performance. So JoJo handed him his guitar so he could sang. Owens rolled into the ring to go after Elias, who hit a high knee on Owens, but Lashley broke up the pin. Crowd chanted "Let him sing." Owens hit a superkick on Elias, then went for the cannonball but missed. Elias went to the top rope and hit the Randy Savage elbow, but Lashley pulled Elias out of the ring to break it up. Lashley got a high leag frog for a clothesline on Elias, then went for his vertical suple. But Owens pulled Elias down. Elias and Owens went for the double suplex, but Lashley suplexed both of them. Lashley still got booed. Owens gave Lashley a big boot and went to the top rope, but Elias gave Owens a twisting power bomb, but Lashley again broke up the pin. Lashley hit Darkness Falls on Elias, then hit the Dominator. Zayn ran out, broke up the pin by pulling Lashley out of the ring, and gave Lashley the Helluva Kick. With Elias still down, Owens hit the bullfrog splash on Elias for the pin.